Yesterday the Neue Zürcher Zeitung published an article about the forthcoming visits of Angela Merkel and Vladimir Putin to Budapest titled “Orbans Tanz auf zwei Hochzeiten,” indicating that Viktor Orbán will be able to have his cake and eat it too. He will remain a member in good standing of the European Union and will be a close friend of Russia at the same time. I, on the other hand, maintain that he will not be able to pull off that extraordinary feat. There are many signs that the Hungarian prime minister is already in retreat. Let’s start with the Merkel visit. Hungarian and foreign observers have come up with all sorts of explanations for her trip, starting with the simplest one–that she could no longer postpone it. After all, she has not visited the Hungarian capital in the last five years, ever since Viktor Orbán’s Fidesz, which professes to be a Christian Democratic party, won a stunning victory in 2010. Her last trip took place in 2009, on the twentieth anniversary of the Hungarian opening of the Austro-Hungarian border for East German refugees, when the socialist-liberal government of Gordon Bajnai was still in power. If the purpose of the trip was to have a serious discussion about the Russian-Ukrainian crisis and Hungary’s role in it, Merkel’s five-hour stay, with very little face time with Viktor Orbán, would not suffice. She is coming because she promised to and because, according to a 1992 agreement between Hungary and Germany, she has to. There are analysts who are convinced that Angela Merkel will not even mention the erosion of Hungarian democracy under Viktor Orbán’s regime, the systematic transformation of a fledgling democracy into an autocratic regime akin to the political setup that existed in Hungary between the two world wars. She has more pressing issues on her agenda: Greece, the sanctions against Russia, and the growth of the German anti-immigration movement–PEGIDA (Patriotische Europäer gegen die Islamisierung des Abendlandes / Patriotic Europeans Against the Islamization of the West), especially popular in the former East Germany. It is unlikely that Merkel will waste any time on the woes of Hungarian democracy. Her only aim is to make sure that Viktor Orbán stands by the extension of the sanctions. This hypothesis, in part at least, is outdated: Hungary obediently voted for the extension on January 29. Others are more optimistic. They maintain that the trouble with Angela Merkel’s visit is that it seems to put a stamp of approval on the illiberal regime of Viktor Orbán. This is certainly how the Orbán government is portraying it. If Merkel says nothing about the state of democracy in Hungary, Orbán’s regime scores a victory. There is pressure on Merkel at home, however, to do something about the Hungarian situation. She has to give the appearance that her visit is something of a warning to Viktor Orbán. There is some truth in this interpretation. In fact, there are signs that behind the scenes some “disciplinary measures” have already taken place. The successful negotiations with the leaders of the RTL Group indicate that Orbán got the message: there will be consequences if the Hungarian government blatantly and illegally discriminates against a media outlet just because it doesn’t like RTL’s news broadcast. Orbán caved, and I for one am certain that he didn’t get much in return. I find it interesting that the official announcement of Merkel’s visit occurred very late, on January 28, the day when according to Népszava‘s information the Hungarian government agreed to a substantial reduction in the enormous tax it had levied on RTL Klub. Was this agreement the price, or part of the price, of Merkel’s visit? Because that’s not all. In his regular Friday morning interview Orbán announced that the exorbitant tax levies on the banking sector will most likely be gradually reduced because the Hungarian economy has greatly improved. “If possible, the interests of the country and the businessmen must be reconciled,” said the man who until now had laid all the financial burdens of his erroneous economic policies on businesses, especially foreign ones. There might be several reasons for Orbán’s cooperation in addition to German negotiations. One is that the Americans undoubtedly know more about the Hungarian mafia state and Viktor Orbán’s role in it than they let on, but the Hungarian prime minister doesn’t know how much they know. That must be a powerful incentive to stick with the countries that provide Hungary with economic aid and military shelter. Another consideration might be the effect of the sanctions and the sinking price of oil on the Russian economy, which makes close ties with Putin’s Russia a less desirable option than, let’s say, a year ago. And that leads us to the Putin visit on February 17. It was almost a year ago, in March of 2014, that the United States and the European Union began applying sanctions against Russia. Although Hungary agreed to support the move, in August Viktor Orbán declared that “Europe shot itself in the foot,” meaning that the sanctions actually hurt only the West and did nothing to weaken the Russian economy. Just about this time, however, oil prices began falling. The combination of sanctions and falling energy prices has made the Russian economic situation close to desperate by now. Orbán was initially very proud of what he considered to be the crowning achievements of his Russia policy: the Southern Stream, which would have brought gas to Hungary circumventing Ukraine, and the Russian loan for the extension of the Paks Nuclear Power Plant. Since then, Russia abandoned the Southern Stream project because of lack of funds, and many people think that the much heralded Paks deal is also in trouble. 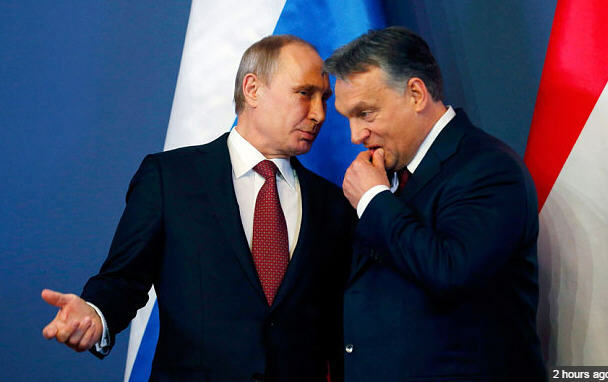 Thus, the rationale for close relations with Russia has more or less evaporated, which leaves Viktor Orbán in the unenviable position of suffering the ill effects of his overly cozy relation with Putin while reaping practically no benefits. Under these circumstances I doubt that the initiative for the Putin visit came from Budapest. It is no longer to Orbán’s benefit to make a lavish display of friendship with Russia. And indeed, the government is trying to downplay the importance of Putin’s visit, noting that it is only a working trip and not a state visit with the usual fanfare. For Putin, by contrast, it is an important trip at a time when nobody wants to have anything to do with him. Just think of the humiliation he suffered in Brisbane, Australia. He wants to demonstrate that he has at least one good friend in the European Union. 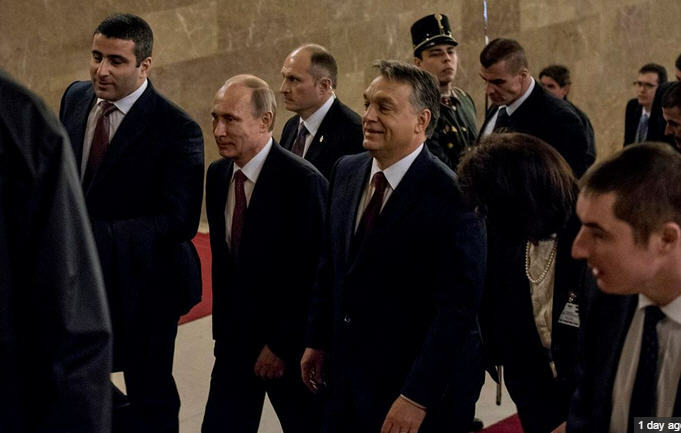 Putin’s second reason for the trip, I suspect along with others, is to find out how much he can rely on Viktor Orbán. Will he deliver as promised? Or it was just talk? Perhaps Orbán oversold his usefulness to Putin and is turning out to be a useless ally from the Russian point of view. 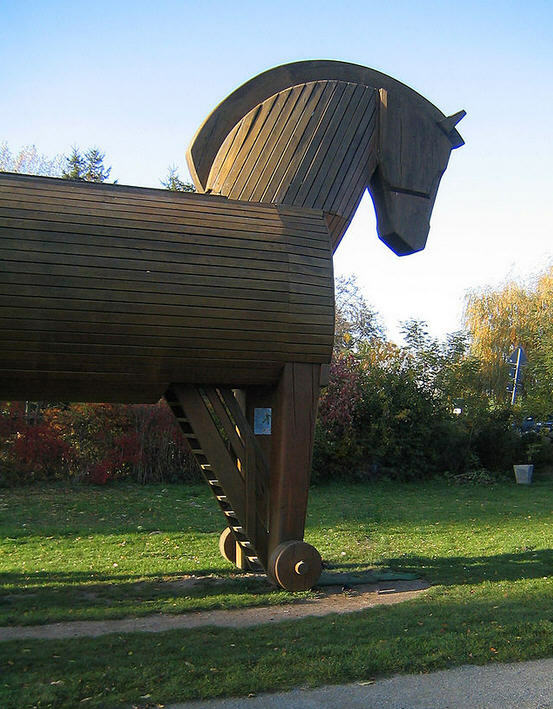 Last August Jan-Werner Müller wrote an article in Foreign Affairs titled “Moscow’s Trojan Horse: In Europe’s Ideological War, Hungary Picks Putinism.” Well, the Trojan Horse may be just an empty shell and the damage it can cause within the European Union little to none. Well, we are back in Budapest’s District V, which is known by many names: Lipótváros (Leopoldstadt), Belváros (Downtown), or lately for a little political propaganda “The Heart of Budapest.” At least this was the name of the mega-project undertaken within the boundaries of the district that made the historic district mostly traffic-free and repaved the streets between Kálvin tér and Szabadság tér, stretching 1.7 km, with fancy cobble stones. Like everything else, the project was largely financed by the European Union. It was Antal Rogán, the newly elected mayor of the district, who came up with the idea of revamping downtown Pest shortly after the municipal election of 2006. He convinced the City Council of Greater Budapest to apply to Brussels for a grant, and it seemed that at least on the surface the SZDSZ-MSZP city and the Fidesz district were of one mind. We mustn’t forget that at this time Antal Rogán was considered to be a moderate and reasonable man. Later the Fidesz media praised him as a truly remarkable Fidesz mayor who managed, despite the fact that the city of Budapest and the government were in SZDSZ-MSZP hands, to receive a huge sum of money for the development of his district. Well, the Heart of Budapest project really was impressive. A good portion of District V became something of a showcase. As we know, Antal Rogán has had his share of his political trouble ever since Péter Juhász, who was Együtt’s candidate for mayor last October, decided to investigate shady real estate deals during Rogán’s tenure. I wrote about corruption in the district in December and again in January. Juhász, unlike most Hungarian politicians, doesn’t give up. Whether he will succeed in putting Rogán in jail remains to be seen. What Rogán did not need was another scandal. But he’s under attack yet again, this time in connection with the Heart of Budapest project. The internet site vs.hu reported yesterday that OLAF, the European Anti-Fraud Office working under the aegis of the European Commission, found serious irregularities in connection with Rogán’s project. 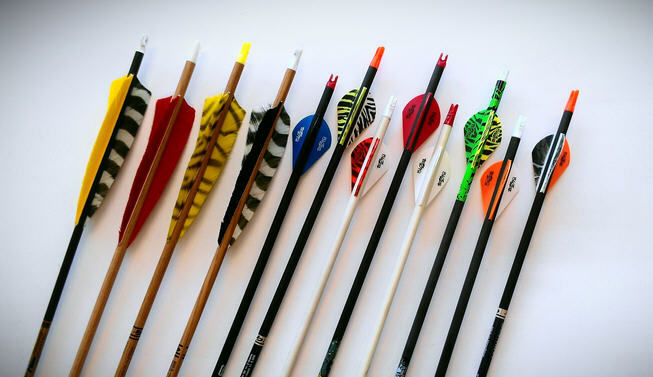 According to vs.hu, OLAF finished its investigation at the end of last year and called upon the Hungarian Chief Prosecutor’s Office to begin an investigation of the case. Naturally, OLAF’s findings were also sent to the European Commission. The Chief Prosecutor’s Office admitted that they received the documentation that supports OLAF’s case but said that “currently work is being done on the translation of the material.” Knowing the Chief Prosecutor’s Office, they will work on that translation for months if not years. Moreover, some opposition politicians learned that in the last few years the Chief Prosecutor’s Office received several dozen such complaints, but as far as we know Chief Prosecutor Péter Polt’s crew did nothing about them. This is not the first time that questions have been raised about the project. At the end of 2012 OLAF found that not everything was in order. There was a good possibility that both District V and the city of Budapest would have to pay sizable fines: about 900 million forints each. The charge? 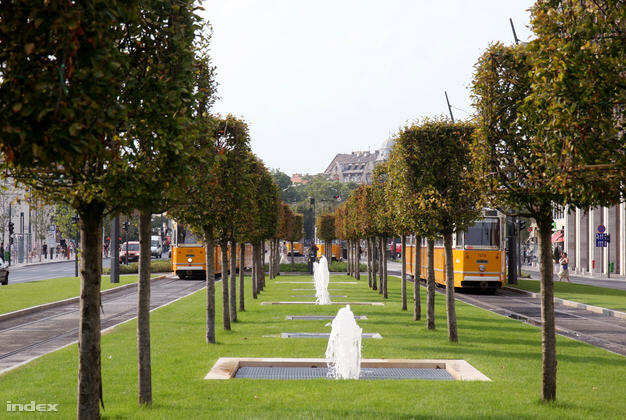 The officials of the district and the city who were handling the bidding process demanded such unnecessary qualifications from the applicants that only one combined firm, Reneszánsz Kőfaragó Zrt and Bau Holding 2000, forming the Heart of Budapest Consortium, could possibly undertake the work. The bidding was theoretically open to foreign firms as well, but I doubt that much effort was put into finding non-Hungarian companies for the job. What kinds of unreasonable demands did the authorities insist on? To qualify, a company had to have references for 1.2 billion forints worth of work on historic buildings even though the new project focused on repaving streets. There was absolutely no restoration of historic buildings. This ploy is commonly used in Hungary to make sure that the “right” company is the successful bidder. In Hungary 40% of all projects end up with a single bidder. Every time such a thing happens we can be pretty sure that corruption is not far away. In 2012, when this story broke, Rogán and his deputy András Puskás, who has since left the district under the cloud of possible corruption, argued that there was nothing wrong with the project. It was done properly. The problem, they countered, was that the European Commission didn’t like the Orbán government and concocted this case to attack Viktor Orbán and his politics. Now that OLAF finally got to the point of calling on the Chief Prosecutor, the district is trying to shift the blame to the current opposition. After all, the argument goes, the first phase of the project was finished in 2009 when Gordon Bajnai was prime minister. And Gordon Bajnai was present at the official opening. I guess that, according to the brilliant logic of the editorial offices of Magyar Nemzet, Bajnai had something to do with passing on the job to an earlier designated firm just because he cut the tricolor ribbon at the opening ceremony. For good measure, Magyar Nemzet added that Viktor Szigetvári, co-chair of Együtt and then Bajnai’s chief-of-staff, participated in the negotiations. Szigetvári calls the accusation a lie. In addition, Magyar Nemzet blames the SZDSZ-MSZP administration of the city of Budapest. 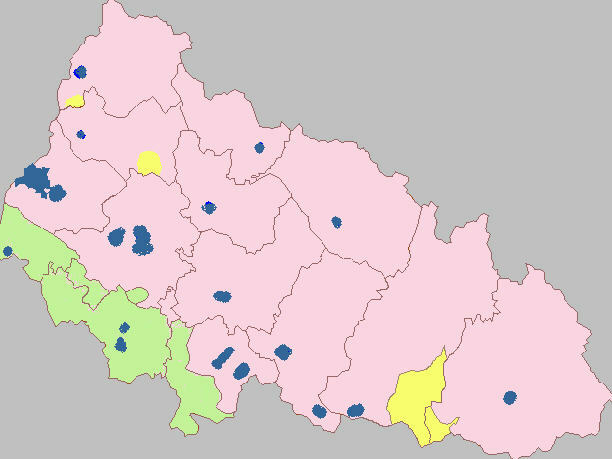 “All this happened during the era of Demszky-Hagyó-Steiner.” Pál Steiner was the whip of the MSZP caucus on the city council while Miklós Hagyó was the MSZP deputy mayor. Hagyó was later accused in a vast corruption case, which is still pending. The lurid details of the case tarnished MSZP and helped Fidesz coast to an overwhelming victory, resulting in a two-thirds majority in 2010. OLAF has been investigating for the last six years. Right now, the Chief Prosecutor’s office is busily, or not so busily, translating. When do you think we will know exactly what happened? If you ask me, never.